Featuring modular architecture, Video Dragon tests high-speed LVDS connections and HDMI interfaces. When utilized as frame grabber, device records and analyzes single images and video sequences in raw-data format or as compressed files. Frame rate includes up to 60 images/sec at max color depth of 24 bits. Utilizing serializer in module port, Video Dragon turns into frame generator that may generate and transmit single images, image sequences, and video streams to target device to be tested. GOEPEL electronic introduces Video Dragon (basicCON 4121), a new solution for the test of high-speed LVDS connections and HDMI interfaces, setting new standards in testing infotainment components. Due to its modular architecture the device can be optionally configured as a frame grabber and frame generator. For this, a wide range of serializer/deserializer modules are available, e.g. for the standards APIX 1 and 2, FPD-Link I/II/III or HDMI. The exchangeable plug-in modules are fitted in a port on the device front, accessible without device dismounting. That means a fast device adaptation for changing test tasks. Utilized as a frame grabber, Video Dragon is able to record and analyse single images and video sequences in raw-data format or as compressed files. The frame rate includes up to 60 images per second at a maximum colour depth of 24 bits. Utilizing a serializer in the module port, Video Dragon turns into a frame generator that may generate and transmit single images, image sequences and video streams to a target device to be tested. Image data can be stored on the device or external memory media via eSATA interface. For image data visualisation, Video Dragon provides a separate HDMI interface to connect an external monitor. 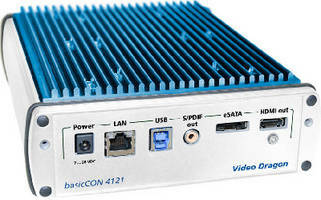 basicCON 4121 can be integrated into complex test environments for infotainment components via the host interfaces Ethernet, GigE, USB 2.0 or 3.0 that are available in parallel. Because most terminal equipment in the automotive sector has separate communication interfaces for device function control, Video Dragon provides respective CAN and LIN ports to turn on and off an ECU to be tested or adjust display brightness etc. Furthermore, the module has a digital I/O interface to trigger and synchronize image data transmission with external devices. The Video Dragon Viewer, free stand-alone software for the record and output of images, image sequences and videos, enables a quick introduction to the image data transmission world. It’s supplied with the instrument just like the also free function library that may help to integrate Video Dragon into user-specific applications, e.g. under C, C++, C# and LabVIEW®. GOEPEL electronic is a vendor of intelligent Automotive Test Solutions – from bus communication, ECU test up to functional test systems for vehicle control units. The company headquartered in Jena/Germany was founded in 1991 and has more than 200 employees. GOEPEL electronic runs service and support offices in the USA, UK, France, India and China to ensure the local and on-site availability of its products via an extended international distribution network.